How can my development team understand the impact of code changes on the network, database, storage as well as the application servers? Problem: The DevOps team at a fast­-growing SaaS provider of EMR was understaffed and lacked cross-tier visibility of their environment, slowing down release cycles and making frequent code updates risky. Executive management lacked the data they needed to make informed capacity planning and infrastructure investment decisions. Desired Outcome: Gain the cross­-tier visibility needed to ensure the availability and speed of their service as well as their processes. Gather the data needed to accurately plan and price based on usage behavior. Solution: Create a cross-­tier dashboard for both staging and production environments so the team can determine expected behavior during a release. This led to faster updates and rollouts, plus the ability to make informed decisions about capacity planning. User Impact: Deploying ExtraHop platform reduced post­-release bug count by over 50%, improved collaboration between teams, and helped double their customer base without increasing the number of support calls. Performance for Citrix Over VPN in solutions. The Development and Operations team at one of the fastest growing SaaS providers of Electronic Medical Records (EMR) in the US was tasked with scaling their applications and infrastructure to meet the company&apos;s rapid growth but lacked the staff to scale as quickly as they desired. Their SaaS solution, which securely houses more than 50 million patient records, helps organizations of any size reap the benefits of EMR, including access to federal meaningful­-use incentives worth up to $44,000. Most EMR systems are extremely costly and complex to deploy on­-premise but with their SaaS model and the simplicity of deployment, they saw a 270 percent growth in the number of users in just one year. Fast applications are critical for physicians who depend on the EMR to quickly access life­saving information affecting everything from patient safety such as drug allergies to patient access such as specialist referrals. As the company grew they needed to ensure the availability and speed of their service as well as their processes, which are based on the Microsoft .NET Framework and a DevOps model. However the DevOps team, who were already short­-staffed, lacked the complete cross­-tier visibility of their environment to truly understand the dependencies affecting all aspects of performance which slowed down their release cycles and made frequent code updates risky. Executive management also lacked factual data around true capacity needs to make informed infrastructure investment decisions. 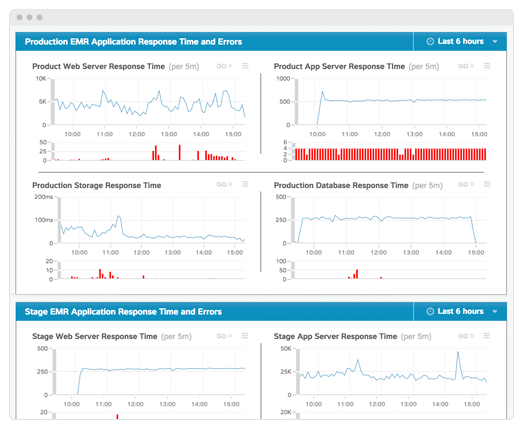 Monitor the performance of applications across all tiers, in real time, with scalability. Because of its disruptive business model, the company saw more than 270% growth in the number of physicians using its solution between the years of 2011 to 2012...As the organization scaled up, they needed to ensure the availability and speed of their service, which is based on the Microsoft .NET Framework and uses the traditional three-tiered architecture. After deploying the ExtraHop platform, and auto-discovering and classifying all network, application, and infrastructure elements in their environment, they were able to create a cross-tier dashboard for both their staging and production environments. 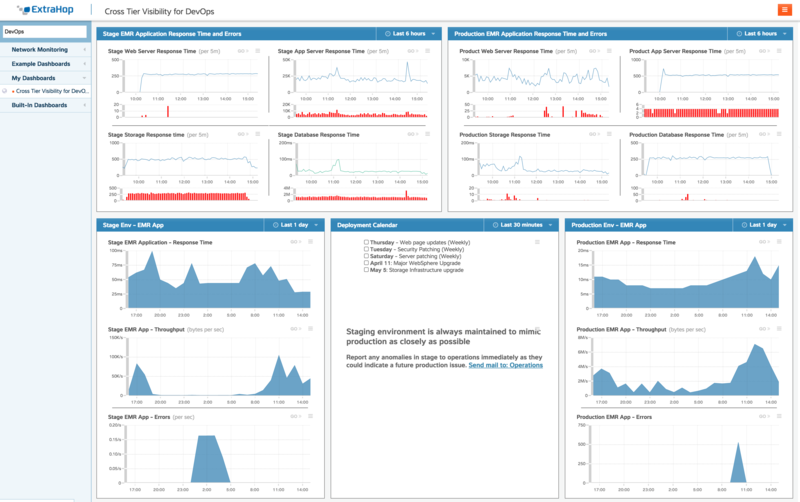 Used by application, networking, and engineering teams, the dashboard allowed the organization to monitor and measure performance across all stages of an application&apos;s lifecycle. In a single page, they were able to observe and compare in real-time the throughput, response time, and errors in the development, QA, staging, and production environments. Conducting this comparison on a single dashboard promoted collaboration and allowed them to quickly determine whether a performance problem was due to infrastructure, misconfiguration, or possibly a code issue. With ExtraHop non­invasively monitoring the staging environment, the engineering teams could observe the behavioral impact of new code against baselined performance and continuously tune for performance. The operations team was able to accelerate application updates and rollouts because they knew the expected behavior before a release, had full dependency understanding during and after the release dramatically reducing risk and as they said themselves, "increasing their sanity." By leveraging information such as the number of SQL queries generated by a single Web request, and the average and median size of each end­-user session in terms of bandwidth, the company was able to plan capacity changes more effectively. Using the ExtraHop platform, the developers can now proactively solve issues before they reach the production environment, which has reduced post-­release bug count by over 50 percent. Remarkably, although the SaaS provider doubled their customer base the following year, the number of support calls remained the same, solving their IT staffing challenge.